I've been trying to sum up my BlogHer experience, and am having a hard time. For the emotional wallop, you'd be better off reading Catherine's and Stefania's posts. For the funny, read Bossy's hilarious wrap-up with photos or her Readers Digest Version. Instead, I present to you my BlogHer experience in photo. I met up with Ann Crady, founder of Maya's Mom, at the airport on the way out. Yes, she is THE Maya's mom. Our flight was delayed by about 3 hours, so we missed cocktail parties with the Silicon Valley Moms Blog and the Maya's Mom crew. We met up with a group of them later, and here she is with the wonderful Danielle of Foodmomiac. 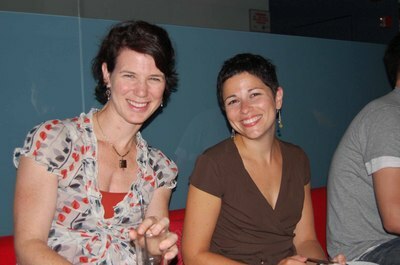 I can't believe I know chicks as cool as these two, Jessica from Sassafras, and Stefania from CityMama. Not only are they smart, funny, and beautiful, they're also fantastic writers. 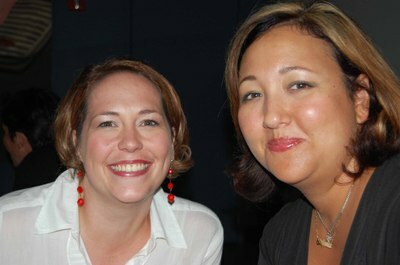 BlogHer was full of smart, funny, beautiful women writers. Jessica, please move to California so we can hang out with you more often. 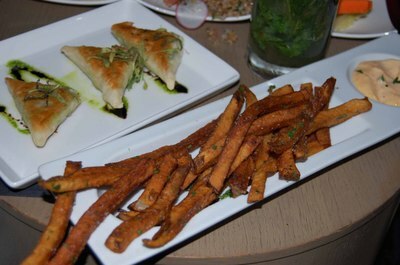 I stayed at the swanky W hotel, where even the fries came with a chipotle-mango-coulis on the side, which was actually a sort of fancy ketchup. I think these cost about $150. Okay, maybe $15, but stuff was expensive. The mojitos were divine. I'm not a big drinker, so one mojito just about put me over the edge.